This scanner has two snapshot cameras of model CopiBook from i2S - France. Each camera takes an image of one page. 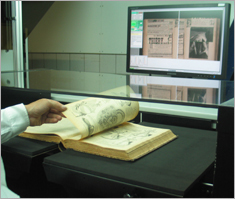 At each snapshot, two pages of a book are scanned. Taking images of left page and right page are done simultaneously. This parallel treatment allows twice faster throughput for a large surface or twice more surface for a given image resolution. Images are taken at optical resolutions of 200, 300, 400 or 600 dpi. Optical resolutions are not interpolated resolutions! The dark casing insures that light from the sides will not interfere on the image. The dark casing is designed in order to vanish light sources and to make sure that incident light does not reach the book. The black roof insures that light reflected from the ceiling or light from lighting of the room will not interfere on the image. Two static lights light up the book from the front and from the rear. The light is in direction of the binding of the book. That insures no shadows in the gutter. The light source is daylight temperature (6000 °K) preserving authenticity of colors of the original, intensity of light is about 1000 LUX, that meets normal office environment. The light source is provided by 4 lamps at 6000 K, daily light wide spectrum, with no infra red and no ultra violet emissions. proportions of objects on the page are represented accurately on the image. A square remains a square (not a trapezoid) a circle remains round (not a potato). scanning surface may be set in the middle of the depth of field of the camera, insuring optimal focus and optimal sharpness over the whole surface of the page.